Conditions to set code 13 can be veicle specific. Many of the early TBI trucks didn't set O2 codes at idle. Some didn't even run closed loop. You need the service manual information to be certain. The goal is to figure out what the engine needs, not necessarily how the components on the engine are doing. Once the engine's needs are understood then you can chase down components related to that issue. Eliminate the computer's ability to respond in order to control what the engine gets. Then you can set the engine's timing, and you can increase or decrease the fuel delivered to the engine. If the engine only runs well with twice as much fuel as the ecm is delivering then you can work on solving that problem. If the engine only runs well with extra spark advance then you can work on solving that problem. It's too easy to lose sight of the goal when approaching the problem at component level only. If you are able to get steady rpm by disconnecting the tan/black wire then you have the ability to see if the engine runs reasonably well or if it still has a problem. Once the timing is set you can look at fuel to see if more or less will improve the situation. If you find a method to add or subtract fuel, and the engine runs better, restore the ecm's ability to adjust timing and see if the problem returns with your fuel adjustment still in place. The only way I can get a steady rpm is by either unplugging the electric connector from the map sensor or removing the vacuum hose from the map sensor - both of which, I assume, force the ECM into the same behavior, which a richer fuel map. I've tried 2 different MAP sensors, I've double checked the MAP wiring and done multiple tests against it using a voltmeter and watched the MAP readings on a scan tool - I don't see anything weird or inaccurate with the MAP's readings. It still runs pretty rough when unplugging the timing advance wire and the MAP is plugged in. So the engine likes getting more fuel. I'm getting a rock steady 11 psi reading between fuel filter and TBI. So logical next step is to do the fuel troubleshooting, right? Maybe start with a rebuild of the TBi and clean/replace injectors and then look at the fuel pump if that doesn't solve it? Last edited by GetItBilly; 11-03-2018 at 10:27 AM. Just a thought, are you sure both injectors are spraying. If tricking it to what should be real rich, maybe there is an injector flow problem. This seems to be going in circles a little bit. I worked for the local chevy dealer in the late 80s and early 90s. When something was not right its was not uncommon to have the idle "hunt" or surge even when the trucks were new and bone stock. Base timing and a tps check are good starts but my advice is still the same hook it all up including the o2 and start from there. I don't think it will fix it, but I think giving the computer and yourself some data may be your best shot at arriving at a drivable truck. There is an idle relearn procedure in the factory manual, but the way your describing the problem I think it's much more than that. I suspect the truck you have doesn't have just one problem, it probably has many. I hope I am wrong as it will be easier to track down just one. If you think the prom was messed with you can probably find a known good one here and compare the two? Factory manuals are fairly good and not much money used on ebay. I have seen people chase themselves in circles for something that was solved in the first few steps of the trouble trees. myburb - yes, both injectors are spraying. I've taken the timing light to them and don't see any big drops, either. donf - Thanks, I will check out the manual. I already have the service and repair manuals, but not that one. I really hate how these Chevy factory manuals are organized and written compared to something like the Toyota ones from around the same year. I've taken a voltmeter to the TPS and it checks out good, no flat spots and reading holds firm when opening and holding the throttle. O2 sensor and clamp-on bung should arrive on Monday. I'm confident base timing is set to 0, at least per the factory marks w/ my basic gun. I've done idle relearn multiple times over the past couple months. Best I've gotten is idle to stay pretty steady around 800rpm, but I can not get past the RPM/VAC/timing advance drop cycle if opening the throttle while in park unless MAP sensor is taken out of the picture. If you're seeing timing advance with the tan/black wire disconnected then you may be exceeding the rpm at which the module advance takes over. Somewhere between 1800 and 2500 rpm, if the ecm is not controlling timing, the ignition module will add between six and twelve degrees of spark advance over a 200 to 500 rpm range. If you are testing for steady rpm in that range with the set timing connector disconnected then you are likely to see large rpm fluctuations. I really hate how these Chevy factory manuals are organized and written compared to something like the Toyota ones from around the same year. Try working with blue oval manuals from the same period. Ford gave out books full of help that were no helps whatsoever. Then move on to Chrysler. Chrysler is simply test and change, test and change. No explanations, no information to help a tech ensure the result of the test make sense in the context of the problem.. They're really bad. Section 3 beginning on page 29 gives a very good description of how the EFI and EST systems work. Driveability symptoms are in Section 2 beginning on page 23. I would not troubleshoot the fuel pump without a sign of a problem with the fuel pump. Pressure specification is 9 - 13 psi for early TBI. This truck is at 11 psi. That's within specification. No trouble = no shooting. ;) If both injectors appear to be delivering fuel consistently I would check the TBI part no and the injector color codes / part numbers to confirm all parts are correct for the application. And I would check the broadcast code on the prom to ensure it is correct for the application. Then I might work on finding a way to see if I could tell how much fuel needed to be added to make the engine run correctly. Engine is a L05, NA4. Here are the injectors. Based on the part numbers - "8655-57" and "8655-64", maybe they are aftermarket? I can't find any reference to them on the internet. Also, they both look to have the same shade of blue paint on the top. I'm just starting to learn about color coding, but can't find anything saying blue is applicable to a 5.7. And shouldn't they be a pair of different colors rather than both the same? Last edited by GetItBilly; 11-04-2018 at 06:58 PM. I believe you're on the correct track. 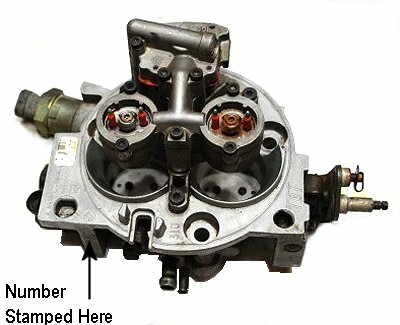 The throttle body has numbers stamped into it that can be used to identify the original application. Is this the original engine that came with this truck? Only modifications are the additions of headers WITH no provisions for an O2 sensor and EGR physically disabled as mentioned in post 1? This is a new-to-me-truck - I have no standard or history to compare how it's running with. Engine might not be stock. Yup, the TBI (17087020) is appropriate for an 87 Truck. (http://www.carburetion.com/CarbNumbe...umber=17087020). I read around a bunch and 61 lb injectors should be the right ones for 5.7 truck, too. "Only modifications are the additions of headers WITH no provisions for an O2 sensor and EGR physically disabled as mentioned in post 1" <-- Correct as far as I know, but I have no clue about engine internals. Last edited by jim_in_dorris; 11-05-2018 at 10:05 PM.